Fog Signals – Chesapeake Chapter U.S.L.H.S. Fog horns were made mostly of brass. There are dozens of design for fog horns. Bellows or pump style, electric or air powered. Fog horns are designed for maritime use and need to be able to resist the corrosive effects of oceanic environments. The first fog signal was used in 1719 at Boston light. It was a cannon. Can you imagine being the lighthouse keeper and having to fire the cannon every hour when there was fog? The first fog signals bells were manually rung. The manually rung bells were replaced by a clockwork, striking a machine that struck the bell. The weight-driven mechanism needed to be wound every four to six hours. 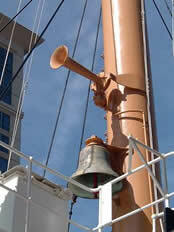 In the early years, large fog horns were powered by compressed air or even by steam. Probably the most famous air horn was the diaphones. It had a distinctive high/low, two-tone sound produced by a slotted reciprocating piston. Compressed air makes for a deep, throaty horn, but it also requires plenty of machinery for compressing the air, storing it in tanks, removing the condensed water, and directing the air into the horn to vibrate either a diaphragm or a piston. Every fog signal station sounded its own distinctive pattern so it could be told apart from all other fog signals. Today, an automatic sensor, which detects moisture in the air, turns on the fog signals when needed. There are also soundless fog signals called radio beacons (an electronic device). 1719 A cannon was placed near the Boston Lighthouse “to answer ships in a fog,” becoming the first fog signal established in America. 1855 The U. S. Lighthouse Service investigated the use of steam whistles as fog signals. 1875 The first steam fog signal on Lake Michigan was installed at South Manitou Island Lighthouse. 1925 The Lake Huron Lightship radio fog signal was placed in commission, being the first signal of this kind on the Great Lakes. 1936 A battery-operated electric solenoid-operated fog bell striker of the clapper type was experimentally installed at the Peshtigo Reef Light Station on Lake Michigan.